Jason Hartman is joined on this episode by podcaster Stephen Eley. Starting back in the early days of podcasts, Steve’s interest in reading books aloud helped him decide to put together his first podcast venture, Escape Pod, begun in 2005 and which is now a very popular science fiction podcast magazine. 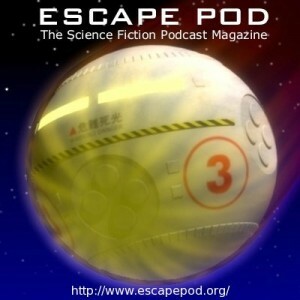 The show provides audio short stories from various science fiction authors. Steve walks through the details that led to becoming a science fiction podcaster, including garnering the support of his wife, a process that a friend of his refers to as “SPU’s” – Spousal Permission Units. Out of the original podcast came Pseudopod, a horror fiction podcast, and PodCastle, which is a fantasy fiction podcast. Steve describes the business model that has successfully supported the shows, while paying contributing authors for their stories. His podcasts are free to subscribers, supported by listener donations and sponsorships. Steve talks about licensing rights and the benefit of added exposure for up and coming authors and new books from seasoned authors. He shares how he initially worked his audience to build listenership. His listenership grew from 100 listeners for the first show to an audience in the mid-30,000s. The best method Steve found for growing the podcast has been engagement in communities that already care about this genre. He attended science fiction conventions, handing out business cards and networking with other writers and fans. Though he advertises on Audible.com, Steve feels word of mouth is still the best advertisement. Steve and Jason also discuss some of the biggest challenges, particularly overcoming personal perfectionism and maintaining support. Steve has since turned over the running of the podcasts to his dedicated staff, but wants the podcasts to continue because he feels it’s a matter of karma. His group is doing it for the community. “This fiction matters. This literature matters. In a world where things are changing so fast …we need to have active imaginations to learn to cope with this world,” Steve expresses, conveying the heart and soul that has gone into the creation and continuation of the programs. This sentiment has encouraged a large and loyal listening audience and a consistent flow of monetary support that allows the company to continue bringing the best listening experience to its followers.